Since I’ve been busy working on some stuff other than Crimild, there has been little progress during the last week. Still, I’m going to take this opportunity to talk about one the latest features that was added to the engine: The Message Queue. Message Queues are used to send messages throughout a system, decoupling the sender from the receiving. For example, a player sends a message whenever he’s hit by an enemy regardless of whether a text will be displayed on the screen or a sound will be played as a result of that. On the other hand, new enemies may be spawned in the level once the player has opened a magical chest. While I was working on the Dungeon demo I needed some sort of messaging system to communicate between the different objects that were part of the simulation. Since I couldn’t find any implementation that satisfies me, I ended up designing my own one. I’m going to start by talking about a common approach that can be found in many textbooks, its benefits and drawbacks, and how I managed to fix the latest ones by designing a Message Queue implementation on top of C++ templates. A common approach implements a Message Queue that is capable of storing references to message handlers, each of them handling a specific message type. When a new message arrives, the Queue forwards it to each of the corresponding handlers. Then, both the sender (the object that triggers the message) and the receivers (the message handlers) are totally decoupled. Besides the getMessageType() method, messages may contain additional information, like the player position, two objects colliding or a string to be displayed on the screen. One of things that annoyed me the most when working with other message queue implementations is the requirement of declaring a message type for each Message-derived class. Since I already have to code a new class for each message, using a message identifier seems a bit redundant. 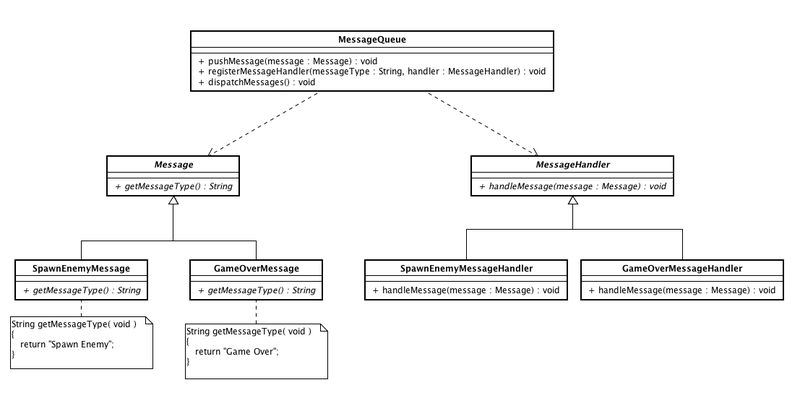 Take a look back at the handleMessage() method declaration in the MessageHandler class. In the code examples above, you may have noticed that we’re explicitly casting the message to its actual type before using it. Like I mentioned before, the message may contain additional information that it’s required in order to handle it properly and the only way to get that is to use explicit casting. Although this may seem harmless, keep in mind that if we have several handlers for the same message, we need use casting in each of them. 1. Dispatch messages to handlers in a simple way. I need a simple interface that provides me a single entry point for pushing new messages and dispatching them to their correspondent handlers. 2. Support any number of messages. 3. No need for message identifiers. I want the message queue to use the message class itself to recognize the type and dispatch the messages to the appropriated handlers. 4. No need for explicit casting on handlers. 5. Allow any number of handlers for any given message. 6. Allow a single class to be the handler for any number of messages. I know what you’re thinking. Having to implement a dispatcher and a handler class per message type is overkill. A lot of classes needs to be written ending up with thousands of lines of code to maintain. It’s total madness!!! Of course, I wouldn’t be writing this if I didn’t know that already. Go on and take a look at the diagram above again. Have you noticed that all the methods are pretty much the same, except for the the type of the argument that represents the message itself? That has to mean something, right? If you haven’t figured it out yet, let me give you a hint: C++ has that beautiful feature call Templates. Templates are used to implement an algorithm independently of the argument types. Then, we will use templates to avoid having to write new classes for both dispatch and handling messages. The abstract base class MessageDispatcher defines the interface for all dispatchers that are implemented using the template class MessageDispatcherImpl. We need an abstract class because we’re going to register all dispatchers into a list within a MessageQueue object (remember that templates end up creating new classes that are unrelated). The MessageQueue class is just a storage for message dispatchers. The registerDispatcher() method is called by the MessageDispatcherImpl constructor automatically. This method ensure that the message is store in the proper dispatcher. Notice that there is no need for either a hardcoded message type nor for explicit casts, making the code easier to read and maintain. Please keep in mind that this is an example application of an unstable feature. There are some bugs that have to be fixed before releasing it to the public. There are a couple of things that need some more work. For example, when is the right time to dispatch all queued messages? The MessageQueue class supports both immediate and delayed modes for message dispatching, but for the last one I’m trying to understand if dispatching messages at the very beginning of the update pass is the best solution. On the other hand, the networking library (which I’m redesigning from scratch) will require message identifiers in order to stream messages thorugh the network. I strongly believe that I won’t have any issue in adding some typed messages here and there, but only time will tell. And of course, there are a couple of bugs to fixed. If you want to know more about C++ templates and generic design, let me point you to Andrei Alexandrescu’s book “Modern C++ Design: Generic Programming and Design Patterns Applied”. It’s a great book and I recommend it not only to C++ programmers but to anyone that has the need of designing a generic API. That’s it for this week. I hope you find this useful and you can always contact me if you have any questions or comments.